Digital Xbox One version reviewed. Review contains some spoilers for the series. 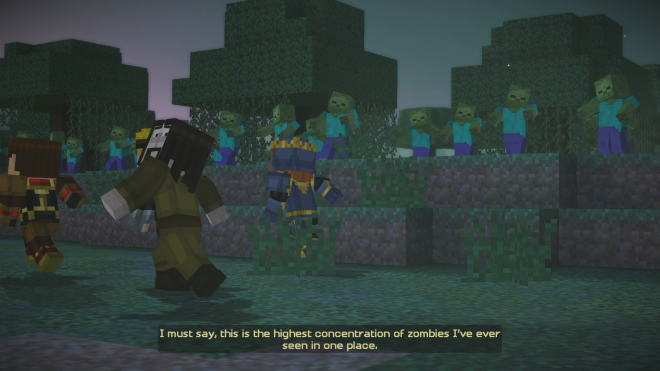 Since the defeat of the Witherstorm in episode 4, Jesse and the gang have been on standalone adventures while they try to get back to their world. 'A Portal to Mystery' follows 'Order Up' in this new standalone format, and is the first of three extra season one episodes. After their shenanigans in Sky City, the gang has found themselves in a much darker world, covered in rain, zombies, and cryptic dinner party invitations. After what is probably the best opening title sequence so far in the series, they enter a creepy mansion and start an old-fashioned murder mystery. The first guest, TorqueDawg, dies off quickly, and afterwards Jesse takes it upon himself to piece together the identity of the killer. 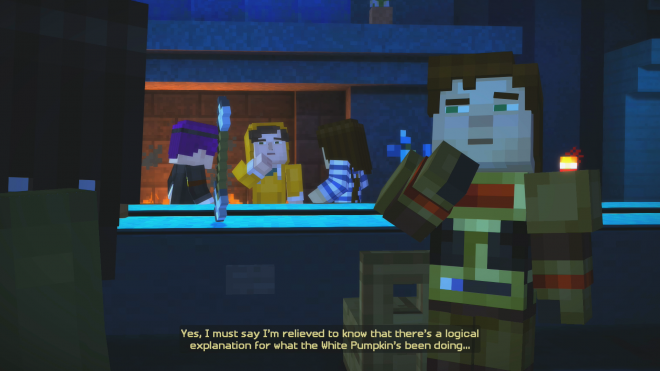 Several of the other new characters in this episode are established YouTube personalities who enjoy 'Minecraft'. There’s Captain Sparklez, StampyCat, LDShadowLady and others with ridiculous names, all with the voices and likenesses of their streamers. Jesse has Petra and a few others are with him, but most of the running time is devoted to investigating these YouTubers and trying to determine which among them is killing people to get at their inventories. Jesse finds clues, interrogates suspects (who are all quite shady, it turns out), and collects evidence along the way. Playing through 'Portal to Mystery' and hearing joke after joke fly firmly above my head, it felt like one big YouTube in-joke that I wasn’t getting. I don’t watch any of these people play 'Minecraft' (I don’t spectate gaming much at all, to be honest) and I have no idea who they are or, even after finishing the episode, why Telltale felt compelled to fan service this episode so hard. 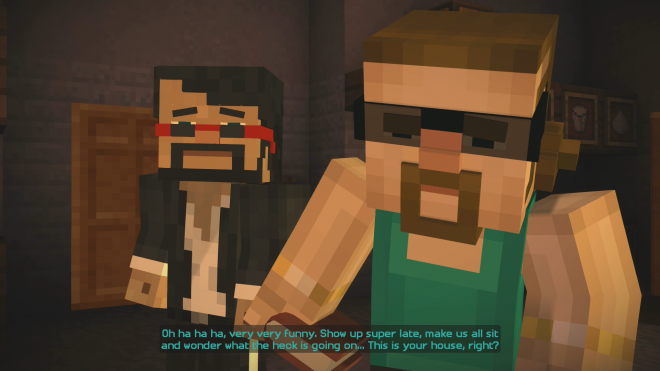 A cameo or two would surely have been appreciated, but as released it feels like less 'Minecraft Story Mode' and more 'Let’s Play with YouTubers Who Are in Minecraft Form' (title is a work in progress). Perhaps if I watched these people regularly I would understand more, but otherwise it’s just not that funny when Captain Sparklez spouts off about TorqueDawg being a known thief and "that’s just how he is". Is he? I have no idea. The parts of the story where the traditional characters are investigating the murders still shine through. Jesse and Petra question the YouTubers one by one and crack better jokes, and watching them all throw each other under the bus seems fair compensation. The more mechanical parts of the story, where Jesse wanders around and pokes things to find how the White Pumpkin (as the murderer refers to themselves) is killing people, is very light and low on interactivity. It’s by far the least interactive episode in the series, which is unfortunate considering how fun the opening sequence was. The crafting is limited to a ladder and a fishing pole, and there’s not much in the way of puzzle solving or even smart QTEs. The deaths themselves seem very un-Telltalelike in general and are used more to advance the plot than as actual events in and of themselves. Whenever someone dies in a horrible fashion, their "friends" briefly comment on the sadness of it, before inquiring about their inventory and then moving on. It’s like even they know that they’re throwaway characters who probably won’t be joining us in the future. Jesse and company don’t know these people and yet seem more affected by the loss, and definitely more interested in discovering why bad things are happening to them. 'A Portal to Mystery' doesn’t have any of the big impressive environments exhibited in previous episodes, being confined to a single mansion and its outskirts. The new characters are modeled well enough. The QTEs were a problem here because the engine seems shakier than usual, and there were noticeable artifacts on screen during cutscenes. The YouTubers are voiced by their real counterparts, which is both a blessing and a curse. It definitely increases the fan service aspect, but it’s quickly apparent that these are performers of a different stripe and not trained actors. Some of them are better than others, but it's the non-YouTuber TorqueDawg in particular that manages to get in some excellent lines. The music seems more flat this time around, probably because of a change in the audio department. The only thing that would make me want to replay 'A Portal to Mystery' is learning more about these YouTubers who are so integral to the script, but the Let’s Play Scene is just not for me. 'Story Mode' has been Telltale’s most consistently unpredictable series in recent memory in terms of its quality. The stronger episodes, full of great jokes, interesting locales, and the occasional heartwarming moment, have been undermined by duds like 'Assembly Required' and now this streamer tribute. It’s best to wash our hands of it and hope for greater adventures the next time the New Order of the Stone meets.